My still-forming ideas for the first part, and the context in which my thesis (“the ecocidal eye: beyond the anthropocentric gaze to a relational gaze in cinema”) rests, are to present and characterise the ecocidal tendencies of the human-centered (anthropocentric) gaze, to examine whether culturally we perpetuate such actions in cultural works we produce, such as cinema. In this article I decided to examine anthropocentrism by considering a new term—’the Anthropocene’ as a means to think about ecocide over the centuries. Over the last few months, when I was reviewing recent data on the state of the earth to form the background of my enquiry, I kept coming across so many different, but as I see it now, related facets of planetary system collapse or change of which the exponential rate and scale of destruction is simply terrifying. The results of globalised ecocide* are evident: in our atmosphere (climate change), in our oceans and waterways (ocean acidification, extirpation of marine species and actual and imminent marine ecosystem collapse), ecosystem degradation leading to gross biodiversity loss (we are now in the largest mass extinction period of the last 65 million years), non-renewable resource and mineral depletion (peak oil, peak nitrogen, peak phosphorus, peak uranium, peak everything etc). I began to see that one couldn’t focus on one particular aspect if one was to understand the systemic nature of ecocide. That one species—and our own at that—is altering so quickly the many life supports of the earth is pretty inconceivable and is leading a growing number of people to call this unprecedented period as the Age of the Anthropocene (the age of man). While there is understandably much attention being paid to climate change (this has been a focus for some in the small area of contemporary art that has begun to look at art & ecology in recent years) I sought out others who were looking at the totality of earth’s biospheric (global sum of all ecosystems) change. In fact, I found that an interesting new educational online animation has been recently created that attempts to collate and present all the earth changes. It appears on the new 2012 Internet resource site, Anthropocene.info, which is compiled by a consortium of science and development groups. It commissioned this short internet video to graphically present these ideas to the wider public but also to other scientists and policymakers over the last couple of months. The new 3 minute video Welcome to the Anthropocene (2012), central to the Anthropocene.info site has achieved online viral status already (see on youtube), despite its data-heavy content, with approximately 100,000 viewers in just two months. This video was also the centerpiece of the recent international conference hosted in London entitled Planet under Pressureat which leading scientists, economic and human sustainable development policy-makers and the media came together to form a document in the lead-up to the 2012 Rio20+ Earth Summit. The short video presents breath-taking NASA-type earth images overlaid with graphic information of the cumulative changes and indices of many of the earth’s systems. 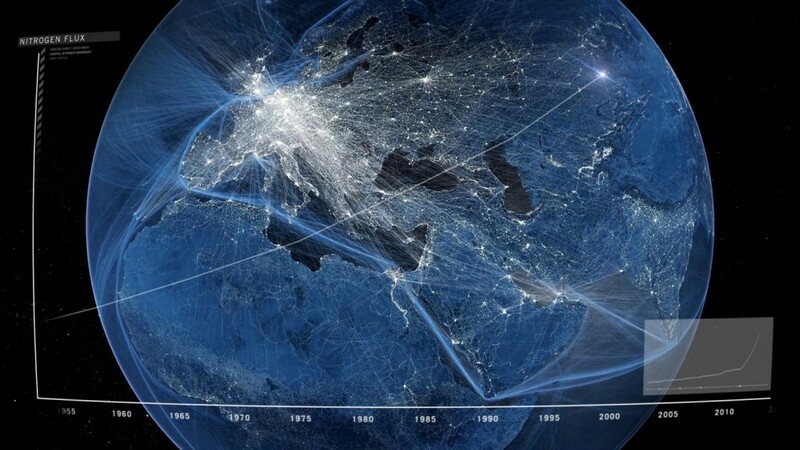 Some have already suggested that these new global images and the concept of the Anthropocene, may have a role as revolutionary in altering humanity’s consciousness similar to what Copernicus’ diagrams achieved in an earlier period of human history (The Economist, 2012). However in many ways Welcome to the Anthropocene seems a very corporate video, “belonging” somehow to the narratives of the unending rise of human “growth” and “progress” espoused by many in the economic, technology and business worlds. Designed for the short attention span of today’s online audiences it conveys these views with aesthetically arresting images that underpin its “story” of the unquestioned primacy of our own species and our “brilliant” inventions. Some have also commentated that this video reveals a quandary for faith believers, as humanity’s widespread effects across the earth pictured here portray a species “like unto gods” (Roberts, 2012). It also simplifies and portrays optimistically its “story of the age of the Anthropocene.” It assures us that “you and I,” as part of humanity’s “creativity, energy and industry,” in this Anthropocentric age will help shape “a new story for humanity.” In its 3 short minutes it emphasises this by giving the viewer a “god-like” position of viewing the earth from above; we see the sublime beauty of earth with its growing and glowing spread of industrial civilisations’ lights across the earth’s surface are presented as an achievement of humanity. Yet in a curious way I couldn’t help think that the title “Welcome to the Anthropocene” inadvertently reminds one of the Frankie goes to Hollywood pop song Welcome to the Pleasuredome** (a song that referenced Coleridge’s famous poem of the false paradise attempted by Kubla Khan): As in fact this is what the dominant and now nearly global industrial societal model has so successfully led to, humanity mindlessly consuming and partying in its own brilliantly lit pleasuredome, divorced entirely from the limitations of the ecosphere. “Some people still consider the world a cornucopia. With the European settlement of the Americas, all of Western civilization experienced about four centuries of exuberant growth, and we haven’t yet gotten over the idea that that’s the natural order of things. The cultural lag becomes apparent when our political leaders still talk (as they certainly do here in Ireland) as if we can and should stimulate economic growth further” (Jensen, 2002). It should also be pointed out that the Anthropocene era or epoch is not an officially recognised geological term. Popularised by Nobel laureate and atmospheric chemist Paul Crutzen since 2000, its criteria as being recognised as an official geological era is still causing much debate in geological circles. In a working party of the Royal Society of Geologists, some leading specialised geologists (stratigraphers) are presently arguing that the amount of geologically quantifiable change from the Great Acceleration will be able to be clearly recognised by geologists in the future from surveying changes to fabric of the earth—”the fossil record.” They argue that this should mark the start of the new epoch of the Anthropocene. Others similarly argue that the beginning of the Industrial Revolution significantly altered the fabric of the earth and it should be start of the Anthropocene. I myself favour, like a good portion of other geologists who relegate geological time to much longer terms, that the age of the Anthropocene began when man moved to a settled agrarian lifestyle (which is already classified as the Holocene) some 10,000 years ago and that simply the Holocene could be renamed as The Anthropocene. Interestingly from my perspective, the Holocene epoch is characterised by the beginnings of settled societies (civilizations) but it also marks the time when societies, becoming powerful and predatory, began to perceive themselves as being separate from, superior to and in competition with nature. While my criteria in my cultural enquiry differs from traditions of geological thinking I can’t but think that anthropocentric cultural beliefs embedded in the dominant settled agrarian communities of the earth have greatly contributed to cultures of ecocide over the millenia. This is a complex area but briefly I think it can be well argued that long held and aggregating beliefs regarding ourselves as separate and above all other living systems over the millenia contributed greatly in fostering both the Industrial Revolution and The Great Acceleration. “two necessary and vital projects that face us today: to re-situate humans within ecological systems, and to re-situate non-humans in ethical terms. The most seriously damaging chasm is that which puts humans in a position outside of and in some senses superior to the natural world.” (Robin and Rose, 2004). Like other people interested in seeing ourselves more aware of our ecological realities, I have occasionally heard (in as much where environmental discourse is held at all) that along with the idea of rapidly adopting widespread laws against ecocide (see my earlier article here), humanity urgently needs new “stories” to help create the new paradigm for the changed world we now live in. New “stories” for our books, films, religions etc., that would enlarge our thinking about the ecological laws and relationships we must observe for all life to be sustainable. However, I think this is only partly the case, as I believe with others, that we have long been on a project of ecological forgetting of humanities’ other stories. There are still existing and much historical records to show that many indigenous peoples developed cultures rich in more ecocentric perspectives, rituals and imagery, that supported their more sustainable lifestyle—cultural traditions and works built up with deep attention to place. Dougald Hine, co-founder of the Dark Mountain Uncivilization movement writes, that as “the systems we grew up depending upon become less reliable, we will find ourselves drawing on things that worked in other times and places” (Hine, 2011, p.269). Jensen, whose quotes I started with, suggests going further, asking that we become deeply cognisant of our surroundings, asking our living environments what they require to survive and thrive, “If you ask that question, and you listen, the land will tell you what it needs” (Jensen, 2009). So in my case its not too hard for me to hear my small forest “say” that for it to become healthy and resilient for all the life it supports (me included), that it must never be clear-felled. The above article is adapted from a longer exploratory article of the same name at www.ecoartfilm.com. It has been published on the HerCircleEzine site of womens art & activism. *ecocide—literally means the killing and destroying of our habitats, and is derived from the Greek word oikos meaning “house, dwelling place, habitation, family” and the suffix “cide” from the French and Latin words to “kill or slay.” For the purposes of international law and building on definitions of ecocide from previous war crimes, environmental lawyer Polly Higgins defines ecocide as “the extensive destruction, damage to or loss of ecosystem(s) of a given territory, whether by human agency or by other causes, to such an extent that peaceful enjoyment by the inhabitants of that territory has been severely diminished” (see more on ecocide in my previous article here). Update: Mon 14 May 2012: ‘The Occupy Movement demands a law of Ecocide! I hadn’t seen this the first time I watched these videos after rewatching the short film you posted earlier I can’t help but see the connections between the glistening spider webs in the forest and the glistening web of light used in the animation of the anthropocene video. I then recognized that it was my familiarity the interwoven strands of the spiderweb that made this animated video strike a chord in my thinking about planetary-wide concerns.